So this was an interesting experiment. My idea was to make my first overcoat with Whitcomb & Shaftesbury as a belted wrap coat. So no buttons on the front, just a belt. A jigger button inside to keep the inside layer fastened, but none on the outside. And a cloth that was soft enough to be happily cinched, but also heavy enough to have drape and flow when untied. Importantly, it would be an experiment I could back out of. From the very beginning, we discussed the design of the coat as one which could be reversed later on. Buttonholes and buttons could be added to the front at any point, making it look and function the same as a normal double-breasted overcoat. This would involve considerable work of course. But it would be possible, and a lot cheaper (and less wasteful) than having to abandon the coat entirely. I like to think I’ve learnt a lesson here. Experiments are fun, but it’s very frustrating and expensive when they don’t turn out as intended. Things of mine I’d put in that category are my Huntsman shooting suit (just too much in every way) and Gieves & Hawkes gilet (not quite functional enough - more on sucesses and failures here). Whenever possible, I find it’s best to build on something you’ve seen elsewhere, rather than starting from scratch. To restrict experiments to things that are less expensive (relative to what you have available to spend). And to make them reversible, or at least adaptable. The design of this coat was vaguely modelled on my navy Cifonelli. It is still very English in cut, with more drape and structure than Cifonelli would ever have, but there is a similar approach to the width and shape of the lapels, and to the design of the pleats and sprat’s heads in the back. 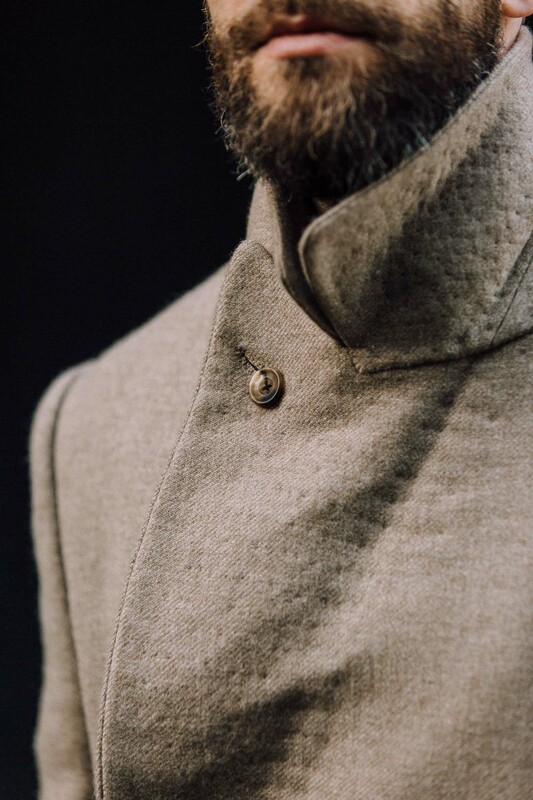 The only additional style details were the swelled edges and split sleeve of a classic polo coat: some points of which my Cifonelli has (eg turn-back cuff) but not all. These, added to the pale-biscuit colour of the cloth, made it feel much more like a classic polo coat of the type that would be thrown over the shoulders after a chukka, or after a tennis match. Which also fitted with the soft, louche feel of the wrap design. When it came to the cloth, my key aim was to use something more versatile than the camelhair I used for my first polo coat – made with Graham Browne in 2010. While there were other issues with that coat, the most pernicious was the colour, which was the strong tan of normal, undyed camelhair. I found this made the coat stand out even more than the length, and hard to combine with other things (the last thing you want in a coat). So this time I chose a colour that, while certainly in the same colour family, was subtler and more greyed. That was 779205 from the Dormeuil overcoating bunch (650g). One really useful feature that Suresh and Sian at Whitcomb & Shaftesbury suggested was having the jigger button loose, on a strip of lining on the inside of the coat. You can see that in the image above. The strip is sewn in under the sleevehole, then runs through a loop below the in-breast pocket, before attaching to the buttonhole on the other side. 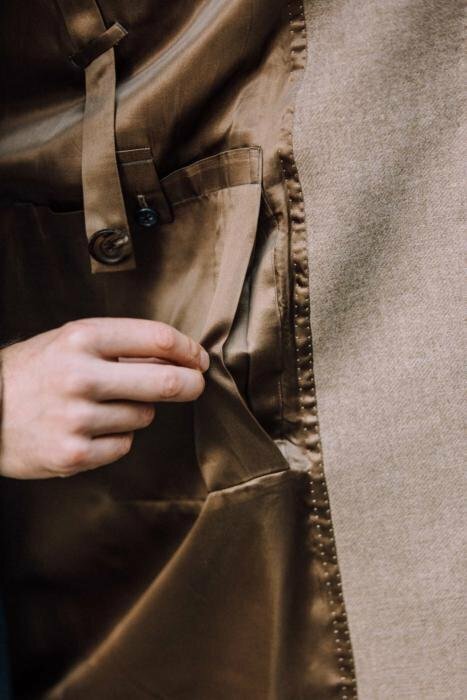 The advantage of this – over a standard jigger button, fixed onto that same side of the coat – is that when the coat is untied, both sides can move more freely. So you basically have three options for fastening the coat: tied with the belt, fastened a little more loosely with the jigger, or unfastened completely. You can see how that middle option looks in the image above. The coat feels and looks loose, but it’s not hanging completely open. 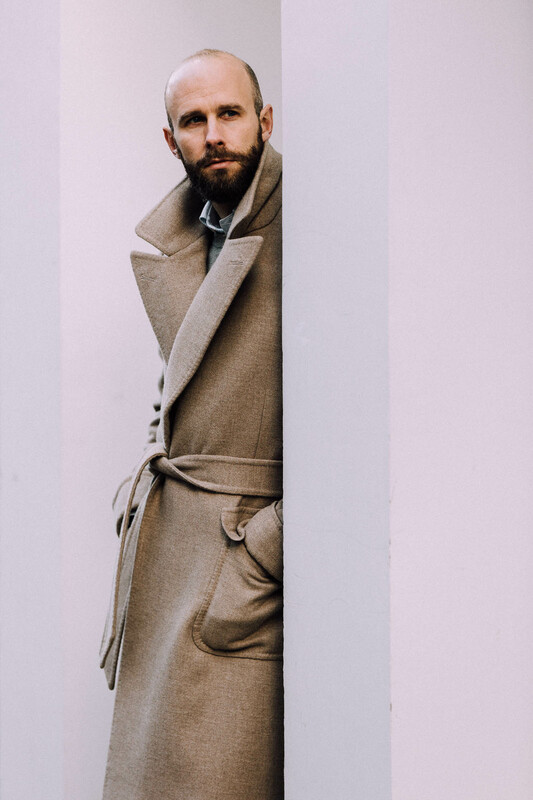 The look works best when you have your hands in your pockets – either of your trousers or of the coat itself. Most of the time the strip of cloth doesn’t show, but even when it does it’s quite tonal and doesn’t look odd. The belt itself also gives you a few different ways to wear the coat - varying by how open you leave the coat before tying it. You can wrap the two sides completely, and tie it together so the silhouette is the same as a normal overcoat (above). Or you can leave it open and loose before tying, creating a more casual and slouchy silhouette. I think the latter looks particularly nice when the whole front edge of at least one side is folded back and tied down – as shown below. Suddenly the whole thing is one long lapel. A last permutation that I requested from Whitcomb & Shaftesbury was the ability to fasten the coat under the neck, making it more practical. Not all my coats have this, and I wouldn’t insist on it if there were a danger of changing the line of the lapels (as would have been the case with my Liverano ulster coat). But here it worked fine, and presuming the belt stays fastened, the whole front of the body is protected from the wind and the cold. It also shows how nice a variegated horn button is on this cloth – and perhaps how it would look with a normal 6x2 button configuration on the front. That last point about the belt brings me onto the downsides of the design. First, the belt doesn’t stay tied all the time. This is not the fault of the cutter or tailor – it’s just impossible with cloth that doesn’t have a lot more texture. That means you have to fairly regularly re-tie the belt You can use a double knot, but that looks bulky and inelegant. You just have to get used to the fact that this is that kind of coat: a little sloppy, never perfect. It’s a look that women are much more used to doing, in scarves as well as coats. Men tend to struggle with it though. We generally tend to prefer everything tied down and buttoned up. Second, such a sloppy look would arguably better suit a softer construction. This is how women’s wrap coats are made – more blanket that coat, just loosely brought together at the waist. In most people’s memories, this is also what the key reference piece is like: the wrap oat made by Giorgio Armani for Richard Gere in American Gigolo. However, while that coat certainly had less canvas and structure than this one, it still has strong, square shoulders - which is the difference between this and most RTW options. So I’m unsure on this point. Which of course, is one of the great reasons why the experiment is reversible. Third, some of the details make the coat a little too showy. And this is a note for Whitcomb & Shaftesbury. The thread they used for the swelled edges and for the sprat’s heads on the back of the coat is lighter than the body, and makes them stand out. This wasn’t discussed when the coat was being made. I didn’t ask either, but the onus is more on the tailor to ask the customer’s opinion – as they should be aware how much difference it will make to the overall look. We’ve discussed this already, and Whitcomb have offered to change the colour if I want, at no cost. Equally, design choices like the ends of the belt have already been changed when they weren’t what I wanted – they were originally rounded, but look better (and are more standard) as an asymmetric point. I must say, however, that the quality of the work on the coat is superb. Double stitching all around those swelled edges, beautiful sprat’s heads, Milanese buttonholes on the lapels, and if anything it’s even better inside: there are lovely touches like a bellows-construction to the poacher’s pocket on the left hip (above). This is all made in Whitcomb’s Indian workshop, under their Classic Bespoke offering – so cut and fitted in the UK, but with all other work in southern India. 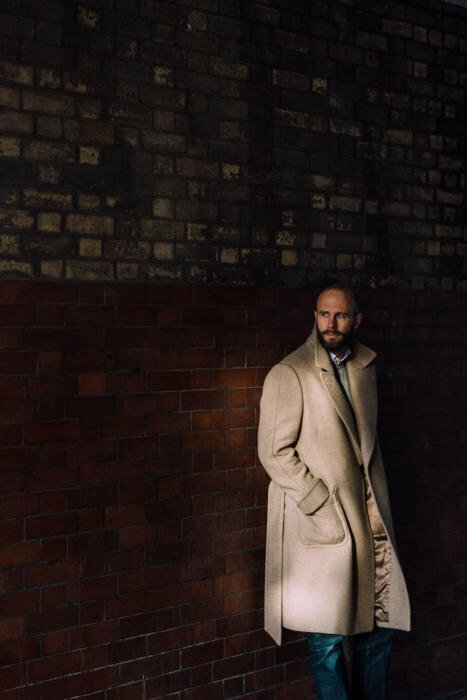 As with the two suits I reviewed before from Whitcomb, the result is even better than that made on Savile Row, but at a much lower cost: £1825 + VAT for this coat, where a Row equivalent would probably be over £3000. In the pictures I’m wearing the coat with jeans, a button-down shirt and cashmere crew neck. This was because I wanted to look at how casual the coat could be. It will suit a suit, certainly, but I also think it could be nice as something worn casually at the weekend. If it could work - traditionally - over a polo shirt and tennis shorts, surely it can work over denim? (Though perhaps darker and straighter than my Cone-Mills Levi’s, pictured). So what do you think? Did the experiment work or should it be reversed? I’m erring towards keeping it as it is, but I’m still not entirely sure. I think I’ll have to wear it with more things, probably over the rest of the winter, before I know. Then I can give it back to Whitcomb for just a clean and press over the summer, or for a re-tooling. The overcoating from Dormeuil isn't available this season unfortunately. However, nice alternatives could be 83926 (650g) in camel hair or 83918 (580g) in cashmere, both from Harrison's. You can follow the discussion on Belted polo coat, from Whitcomb & Shaftesbury by entering your email address in the box below. You will then receive an email every time a new comment is added. These will also contain a link to a page where you can stop the alerts, and remove all of your related data from the site. I think this is one of the best commissions you’ve had done in the time I’ve been following PS. I already frequent W&S but this is just another confirmation of their talent. Top marks all round. Love it. Going for my first ever bespoke commission tomorrow with W&S (wedding tails). Any advice on how to approach it all / what to ask for etc etc? On this – my first thought was it should be a bit softer construction – suits that louche look very well. I like it though. Have you though about putting an additional strip of fabric on the belt to add some texture so it ties better? I would put a strip of suede on the underside of the belt, a nice flourish and would provide enough grip that the belt would function better? I wouldn’t add buttons / change. I like it. Fair enough! What a couple of D rings in a nice heavy brass that will get a nice patina? I guess belt might wear our. Thoughts / advice on first commission from W&S welcome! I think D rings might be too rugged and functional for this, and yes wouldn’t be great against the cloth. In terms of general commissioning advice, it’s too much for a comment really – have a look at other features on the site, or perhaps come back with more specific questions or things you’re unsure about? Hi Simon, I was about to suggest the same thing. The strip of suede (tobacco brown would be nice) doesn’t have to go all the way down to the end of the belt, just over 20 cm around where you usually tie it. Overall I think the coat looks great, if slightly effeminate. Great color too. Much as I admire your willingness to experiment and innovate, this strays too close to dandyism for my taste and, belted, reminds me rather too much of a dressing gown. But, of course, this is a matter of personal taste and it appears to be beautifully made. Thanks for sharing. And the price is very good! For what temperature range is it meant? I would like to know the cost? It’s in there Stephen – read a little closer! You mention it’s less than Savile Row, is that because it was an experiment or are they usually less than Savile Row? Their classic bespoke service is largely made in their India workshop and is therefore considerably less. Perhaps have a read of the reviews linked to in the piece? I’m a bit conflicted, I’m guessing India is chosen as it’s cheaper to produce? If 100 Hands shirts were made in England or Italy do you think they would cost twice as much? I’m starting to worry about the ethics of how the people are treated. From what I know, the people are treated very well. In fact, the whole venture was started as a way to give people employment after the tsunami. Generally I like the style and I must say that the fabric and finishing looks great. Have you tried tying the belt by looping it over once more? This works with my dressing gown cord which has a habit of coming loose as you described. Very nice experiment and the outcome is wonderful. It’s nice to see you styled in a bit more casual way lately as I always look for ideas to a more “chic casual” style. If anything the cloth could be a little looser. Right now it looks like it’s really warm. A little thinner and you could wear it more easily in early spring or autumn. This is a very beautiful garment in itself, but I find it a little dandy, and possibly a little too redolent of a woman’s coat. Perhaps these two qualities could have been mitigated by a more conservative colour, such as navy. Also, I do not think your outfit coheres, either aesthetically, or (to steal Dieworkwear’s idea of outfits being more like books than paintings) in terms of how it ‘reads’. Some tonally similar chinos, with your Common Projects, might be more pleasing to the eye, and could add a youthful/sporty edge that counteracts the dandy feeling of the coat. In response to your final question, I think you should change it. The fabric and cut are beautiful and remarkable in themselves, and should be the centre of attention. However, with the belt, it’s all too much. Thanks for this article — very interesting, and a beautiful garment. Then I saw the ‘poachers pockets’ and thought you might be poaching rabbits now you have only the one job . But then as you keep scrolling and keep looking at the pictures it’s slowly starts to appeal. I think with a few more scrolls it’ll have won me over . Though still don’t like the pockets . as this is a winter coat, I have a winter question. What kind of bespoke shoes/boots do you order for the kind of winter that we currently have in continental Europe? The streets are wet and snowy and I don’t want to restrain from having long walks outside and I don’t want to restrain from wearing a suit. As a result all my shoes are suffering a lot. How do you mitigate this problem? What would you advice for a next winter bespoke shoes/boots order? Hey Hristo. Although we don’t get that cold too much in the UK, we do get a lot of wet weather, and I feel that’s the biggest challenge there. It’s not as if people’s ankles get that cold – and wool socks are a nicer option there. For wet weather, I tend to wear more cordovan or grained-leather shoes, and suede as well if it’s been regularly sprayed to protect it. At least with suede you don’t have the salt-stain problem, which is such an issue with calf. Yes, it is not an issue with the temperature. I have a good collection of over the calf socks and some of them are really warm -> like 100% cashmere socks or camel wool socks (by the way I am starting an own sock production company this year). It is more a problem that the shoes get very wet from the outside. So I am thinking if I should order thicker soles and thicker calf leathers like the Horween Hatchgrain or something like that. You still have galoshes. Not elegant, but protecting your shoes. Have a look at those made by Swims, they’re a little more… well not stylish but stylized. I am not sure if this is something for me, but I might test it. I have to visit one of their stores to check if my shoes would fit in such galoshes. My heels are a little bit higher compared to RTW shoes so the galoshes might not fit. I have to check this in person. It’s like wearing a mac when it’s raining cats & dogs, they’re not stylish nor the most practical, but they offer a good protection for your shoes. Several shops in London have them, I bought mine at Foster & Sons in Jermyn Street. Like your RL blue and white cardigan wrap I would only wear this garment indoors as a dressing gown. Looks to be beautifully made though. Hi Simon, lovely coat. I recently commissioned a belted polo coat with W&S as well, but with a buckle belt and a 6×2 button configuration. 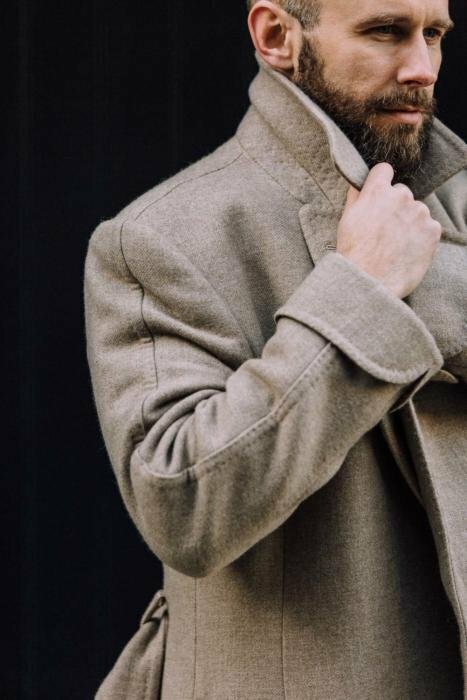 I would say the stronger construction at the shoulders certainly allows room for the buttons; but seeing you being able to wear the coat differently, especially the way it sits causally with your denim trousers in picture 9, I think the coat looks great as it is. I wouldn’t change anything. 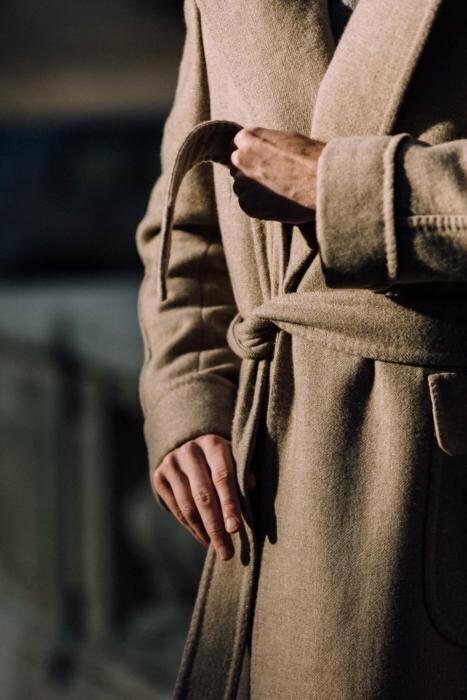 As many commenters have / no doubt will point out, I think the immediate reaction and risk from a long, belted coat like this in a soft fabric will be that it’s more dressing gown than outerwear – the turnback sleeves don’t help to dispel that impression either. Without the belt done up it looks fine, but at that point, it’s essentially single breasted and sort of defeats the object. Maybe it’s just that buttons are functionally and aesthetically better in these situations? Looks wonderfully made though, no doubt about that! I’m very intrigued by this. The fabric and color is absolutely beautiful and I love the idea. However I think it would benefit greatly by a softer construction as you say. 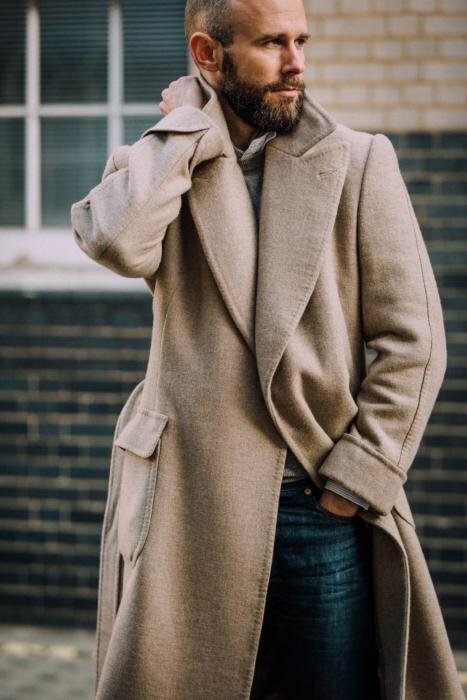 A softer shoulder with no or at least much less roping would soften the whole look, something like your Stile Latino db coat, or even a raglan sleeve. I personally also think the back should’ve been clean instead of the inverted pleat. You could still have it cut slightly bigger than you normally would given the louche feel of the coat. With just the anchor button closed and the lapel buttoned up I get some vibes of Stòffa’s asymmetrical coat, which is not a bad look at all. I’m torn, I really like this concept, but I think in this execution I’d be bugged by the aforementioned issues and eventually end up adding buttons or just not using it. Having said that, I really love the idea, perhaps a 2.0 version? I had a coat made according to this design. My tailor advised that the inverted pleat is functional, allows the garment to adjust to whatever is worn beneath. I like it a lot, Simon. Great alternative to casual coats like your bridge coat or a pea coat. 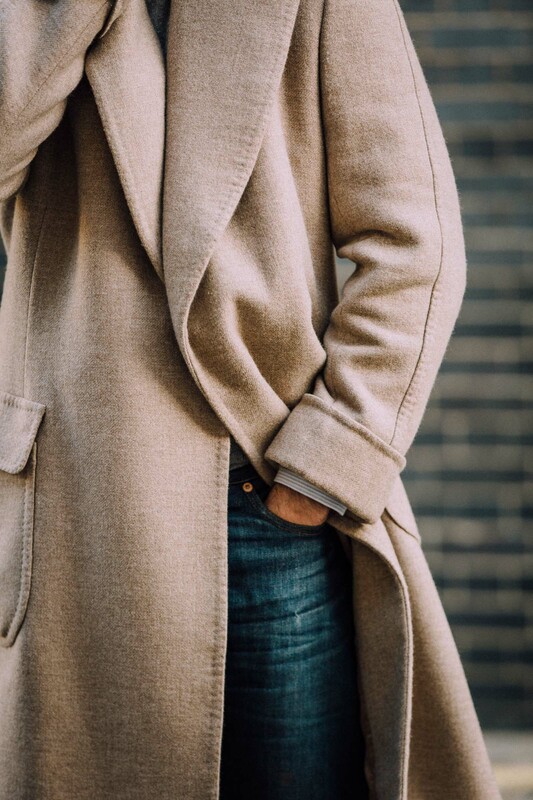 What’s your thoughts on the length though, since you normally advocate for a longer coat? The finishing and details on the coat look great as well! You’re right Phil, it could have been tad longer. It’s actually the same length as my Cifonelli, but I think looks a little shorter because of the colour. Still about two inches below the knee though. I think you are being too harsh on the coat Simon; it looks superb and is very different to what you see out and about without it looking too contrived. What is a ‘sprat’s head’? 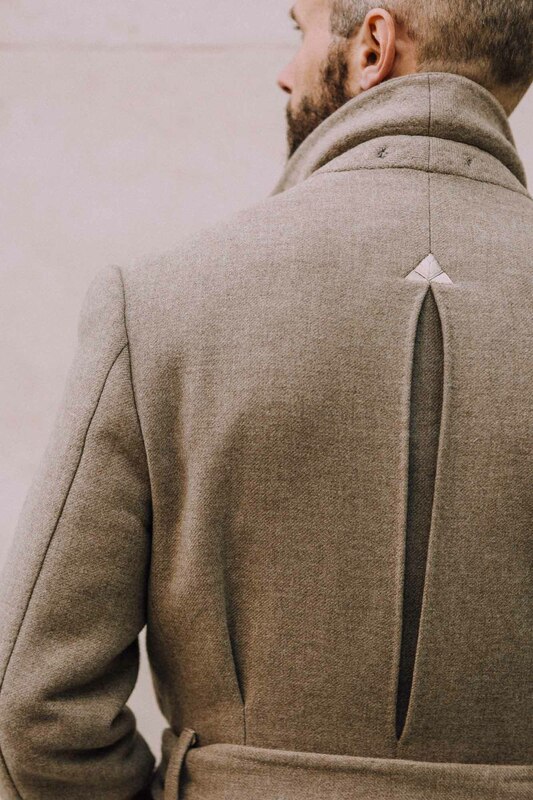 The small triangles of stitching on the back of the coat. Theoretically there to stop vents or pleats from tearing the cloth under pressure, but really just decorative when done like this. Your poor camel coat gets so little love from you Simon! 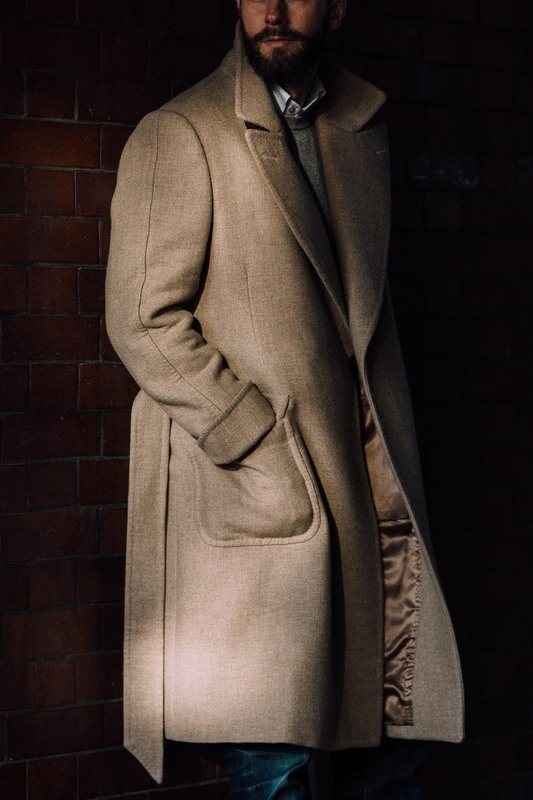 I’ve always thought it an attractive piece and I’ve been tempted to commission my own, swayed in no small part by that classic American Giggilo photo (which this coat reminds me of actually). Now that you have more coats in your wardrobe do you wear it more? Would you really not do it again? The jigger looks a little unwieldy. Did you just consider a normal button? You mention you could wear it with a suit though it seems very casual for that. Some people have used the word ‘Dandy’ though I don’t think it a bad thing. We did consider just a normal button, yes. I liked the functionality of this one, though, and of course that would be quite an easy thing to change later. I think it would look nice over a grey suit, white shirt and tie. Although the colour would make it a little unusual. My two cents, if I may, is that it is a lovely and stylish piece, even if not to my personal style (much like corduroy looks great on others but it rubs me the wrong way). I find this coat to be so different than what you have otherwise in both design and color whereas if you added 6 buttons on the front, it would be only unusual in the color. Perhaps the photo I like most is photo 8 and I am imagining just a single row of two buttons at the point which could keep the long, long, lapel which I find quite flattering. If you do end up putting 2 columns of buttons, how do you see them being arranged? Their house style seems to be quite columnar || but could they do something more curvy or fluid )( ? Thanks Hugh, and great point re taste and cord. Is that something you can request, and how far can you push it? Yes, you can request slightly different position of the buttons. I wouldn’t change it very much though – seriously consider whether you like the tailor’s standard orientation (it will be very classic and traditional) and only move things a very small amount. 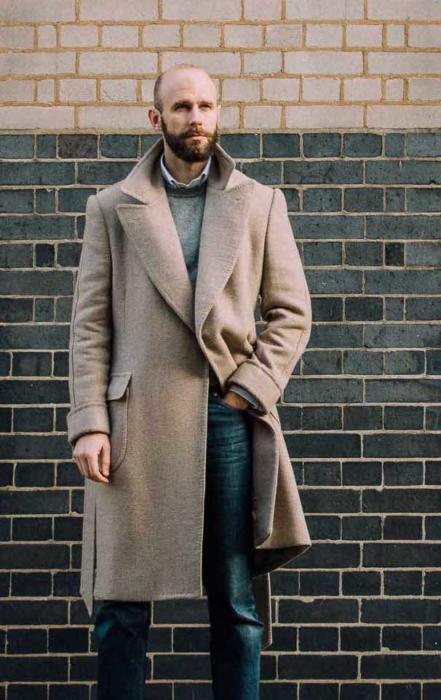 As the bridge coat was a success (at least in my opinion, being an owner of one myself), would you consider making an overcoat collaboration in the future (maybe with buttons, not belt)? However, it could be the colour of the coat speaking, as I just think its quite amazing! It’s certainly something I’ll look at, yes. As I’ve said before though I try to do these collaborations just when I feel there’s something particular lacking, and people do offer that kind of overcoat fairly regularly. the coat looks fantastic; I’d even go as far as to say it’s my favorite one on this website. I would keep it as is, the experience looks like a success. I have to get a coat for next winter (it would be my first coat), and I this style is really appealing to me. Living in a place where winter can be rather cold and well under the 0°C line, how warm is it, especially considering it’s construction? Love the fabric and the color, but the belt make it look too much like a woman’s coat. So, I’d suggest putting buttons on this otherwise gorgeous coat. I’d also like to see it longer as well,mid calf would have been better. I have long coveted a wait-coat inspired model of my own. This experiment would qualify as a success in my book! The main reason for my comment, however, was to note what a treat it was to see the 2010 post and how far your updates have come. There is a certain charm to the old, hastily shot photos just as their is a beauty to your current, more professional shots. Thanks Fletcher – feels like a long time ago! I think you should add buttons (but still keep the belt) for several reasons: 1) they would give it a nicer look eapsecially if they are a nice shade of dark brown. 2) They would add structure. 3) The coat as is looks a bit feminine ( as you have correctly pointed out, women overcoats have this same structure/look). I think this experiment works very well Simon. Of your more casual overcoats which do you prefer – this one, the Stile Latino, the PS bridge coat or your duffle coat? Or maybe one I missed. What do you think would be the most versatile style, bridging best across tailoring and casual wear? I ask as my current overcoat is wearing out. I work in a smart causal office but do wear a suit once every two weeks or so. A single overcoat that can be worn to the office and around the city on weekends is what I need. It needs to stand up to cold Canadian winters and winds. I have a parka for minus 20 celsius and colder so it doesn’t need to cover that end of the spectrum. I think a DB style would be best. I love the PS bridge coat but it is to short – I need something that reaches near the knee. I was leaning toward a longer bridge coat or a polo coat but thought a duffle might work very well in a conservative colour. What do you think? If it’s about having one core, versatile coat, then I’d steer away from the duffle coat or anything as unstructured as the Stile Latino. 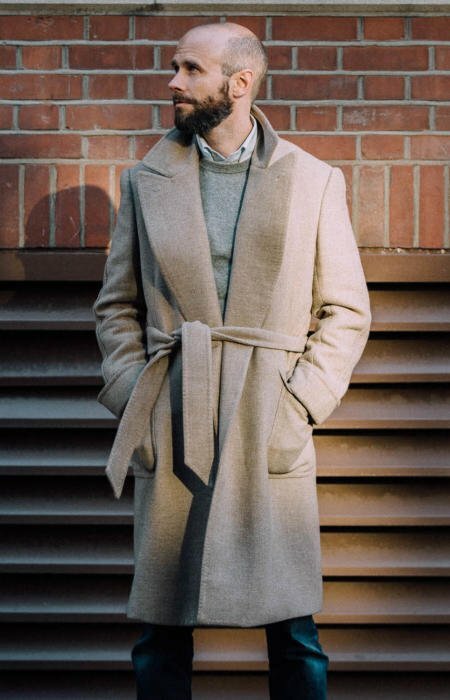 Get a long DB overcoat, probably buttoned rather than belted like this, and then just consider the material. Navy might be too smart for your casual things, brown tweed too casual for your smart ones. So perhaps a grey herringbone, somewhere in between. More on this here obviously. I’ve got several nice overcoats (thrift store gold!). I’ve found my British Warm, with its thick Crombie melton in taupe, to be versatile and warm enough for a harsh Canadian winter. Not feeling this. Looks like a glorified bathrobe. I think it would have helped if you added a breast pocket. My opinion is to add buttons and the pocket. I think it’s epic. I had wondered whether this might be your commission when I saw it on W&S’ Instagram feed. Great detailing with the sprat’s head. The point has been more than once already, but this coat really does look like a winter dressing gown. It makes you look both over-dressed and under-dressed at the same time. You’d be wise to avoid wearing a striped suit underneath it and give the impression you are wearing pyjamas. – I do not like belted wrap coats, even though loose coats with such a belt have become trendy. I guess fashion has it that in a lifetime everyone will desire at least once loose garments and then fitted ones. A good thing after all, but I already had my loose phase and I feel it unlikely that it seduces me again. – it is so loose that I cannot see a strong case for having it bespoke. – as stated by the very few negative comments, it is reminiscent of a dressing gown and looks feminine (would be worse without the structure). It gives the impression that the coat was not finished and a belt was added to allow the coat to close. – I like sprats and share your issue with the light thread; I also wonder whether a sprat makes sense when the back is already loose. – I generally dislike double pick stitching and find it is even worse on a heavy cloth. Thank you for sharing this experiment. I recently wondered what people thought of such coats. It seems that a collaboration may be a success (although there is sometimes a gap between liking and wearing). The Polo Coat was once a staple item in the US in the ’20’s, a high fashion item in fact. It seem to have been usurped by the female, my own was stolen by Mrs Fastship. Simon. This looks just superb. It’s not an everyday item but the joy of having a wardrobe with the all of the basics covered is surely that you can go off piste and choose something really extravagant and beautiful which you can feel special wearing. That is what I really hope this feels like. I would love to see a few photos with other outfits underneath. I’d really like to see it with a serious blue suit and some of those dark brown shoes you have a few of. Love the American Gigolo reference. Before I read a word of the post I was hoping there would a photo of you next to a convertible Merc SL ( in the suit? ). I will seriously think about something inspired by this. Love the shape, cloth and color. It seems that it would benefit from buttons though. Could you still use the belt in some way with a DB configuration? Simon – While the style of a “belt-wrap” isn’t to my personal taste, I must say that given the apparent quality of the end product, the price seems a steal! I’m awash with questions so please forgive if this is too much but, 1) How long did the coat take from initial consultation to completed piece? 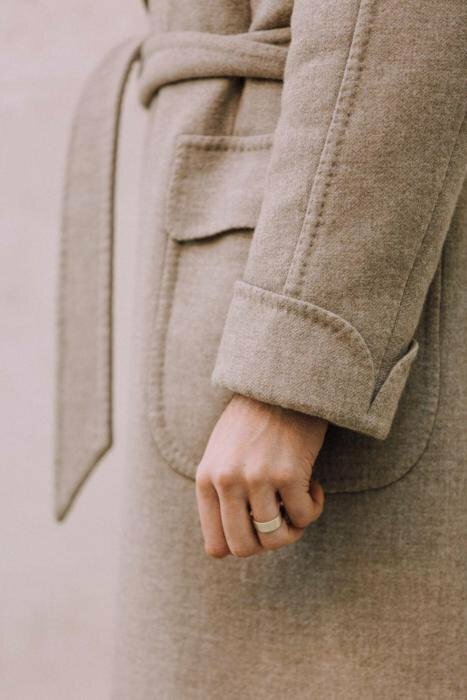 2) Any particular reason you’ve chosen back pleats both here and for some of your other coats (perhaps this leads directly to my next question) 3) If one thought they’d wear the coat more often without a jacket underneath, what considerations need to be made? 4) As I’d likely go for something I can get maximum use from, I’d likely go for a wool navy do you have any suggestions for the cloth? I’ve noticed that with certain wool coats I have, cashmere scarves shed like crazy against them. Not sure how much is down to the coat’s material and how much is down to the Begg scarves I’m wearing. 5) If the price you’ve referenced only covers the work done by the tailor, what was the additional cost of the material and buttons? Thank you. 5) Nope, it was the whole cost, cloth and all. That’s the value of being largely made overseas. I’m not a fan of belted overcoats. As others have pointed out, they look feminine and resemble robes. But they are in style at the moment, so mine is an ever less popular opinion. My primary reason for recommending added buttons, though, is not my prejudice against the belt—as I assume you’d keep the belt even with buttons—but my opinion that a double breasted coat never looks better unfastened. The photos you provide here confirm this. All the good a tailor does for your silhouette is lost. And there’s no circumstance that demands a coat be unfastened, as perhaps one does with a double breasted blazer when sitting down. Doing so is always an affectation and one of no visual appeal to me. I’m all for keeping the coat as is, Simon. It has such a potential to express sprezzatura while remaining functional. It’s very unique compared to the rest of your coats, but it’s also not different just for the sake of being different. Pretty bold. This experiment paid off. Great casual look. Especially with jeans and a sweater underneath. Great post as always! Off topic, I was watching your valstar suede care video on YouTube and was interested in the provenance of the the v-neck sweater? Looking for something similar in colour. Would you trust W&S to do this with a v v soft shoulder construction? Sounds like you wouldn’t get them to do something southern on a jacket but is it different on an overcoat? Not really, no. It would be slightly easier on a coat, but I’d only do it if I had seen something made with that construction and could try it. Otherwise I’d always go to a Neapolitan or similar. W&S may be cheap, but if you don’t like the end result, it’s expensive. Good to know thanks. Thought that the margin for error probably a bit wider on an overcoat, but if that isn’t the case won’t take the risk. I asked Mr Bigg, the coat maker, about a soft shoulder on an overcoat. He very politely but very firmly said no. Interesting and looks beautifully made, but I think I’m in the dressing gown faction on this one. Tangential question on overcoats/jackets, is it inadvisable to use a messenger bag slung over your shoulder on a good coat or jacket? It’s not that heavy but does it damage or stretch the fabric significantly over time? How many fittings did you have? Must be rather awkard, having the item shuttling to and fro between India and London. Doesn’t it drive up production costs? And what if the item is damaged or lost in transit? Doesn’t that drive up insurance costs? I had two fittings, but no it works well in terms of timings and costs still. Particularly as the brothers own the workshop. The only thing you could make an argument for is carbon footprint. For the carbon footprint argument to be completely valid, you might first have to factor in the carbon footprint of the tailors in London vs. India — which likely is 5 times higher in London (cf. http://citycarbonfootprints.info). If carbon footprint was an issue the answer would be: go to your local tailor and ask for local cloth. Avoid trunk shows, avoid flying to tailors abroad. I would switch to buttons. The first photo (“full belt”) reminds me too much of a bath robe as others have said already. The second (“long lapel”) looks good, but somewhat defeats the purpose of having a heavy coat. The unbelted wear feels like it should perhaps better have been a raglan. Lovely choice of material though! All in all, and given you have the chunky black/white raglan as a casual coat, I’d vote for experiment to be reversed. Do you think this coat would work with jeans if it was in a less unusual color, ie navy? Simon, I fall into the camp of reversing the experiment. The belt design makes this coat look way to feminine which must be avoided. I would urge you to remove the belt and put on buttons to make it look like a man’s coat, not a woman’s. You can still wear it casually because of the overall design,fabric, and color all of which I like. Sorry. Looks like a bathrobe. Absolutely gorgeous – in my estimation, this is your best commission yet. Beautiful cloth. A shame that the design approach was so fusty, particularly the turn back cuffs which accentuate the ‘dressing gown look’. Out of interest I wonder what W&S’s approach would have been if they were designing. As a matter of aesthetics I question posing in alleyways as a context for a soft, light, casual bespoke garment. Leather, denim, heavy, dark garments certainly. A better canvas might have been a well lit cafe, hotel, recreational space. The casual essence of the garment would better suite an athleisure tone: light colour trousers, pale leather trainers, soft hoodie, beanie (all in your collection…). Harrrumph. Looks too much like a bath robe, to my taste. What’s the point of having heavy cloth if you can’t button the coat? A lighter cloth might make the design more sensible. Love the coat. It looks suberb. Would love to have one like that, although I do think it would not do in the Canadian climate. Material is fantastic. Don’t change a thing. I’m also in the dressing gown camp, but it could be rather clever. I can see it in a “why on earth is that chap wearing a dressing gown?”, “my mistake, it’s a coat, that’s rather lovely” kind of way. But not the long lapel style of tying, that just looks odd. A very interesting experiment and a fine result. A ‘full’ polo coat would perhaps be a tricky commission in which to let tailoring skills show through? 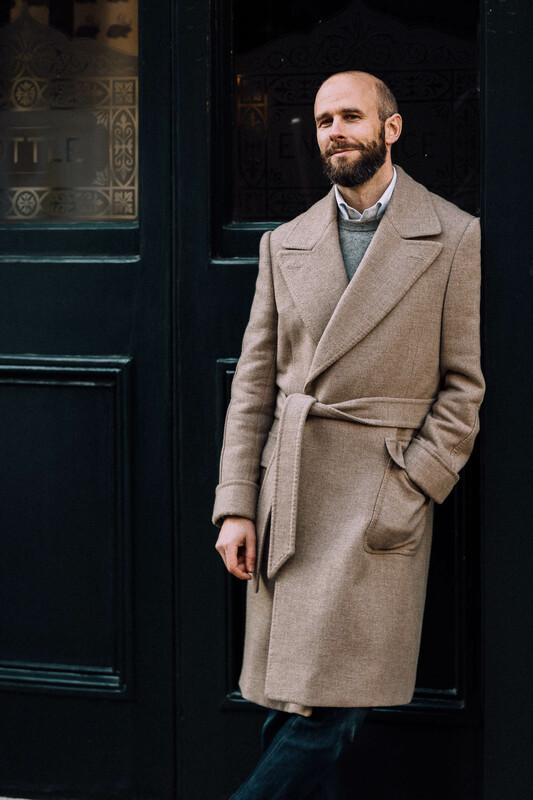 If the coat is roomy and ‘flowing’ (it is after all a posh tracksuit substitute) then it’s only the quality of the cloth and stitching, and lie of the collar that show its quality. Your coat is more structured and fitted than a trad polo, as you indicate, and the workmanship is very impressive. Perhaps a solution to the belt issue might be a hidden button as a twin to the jigger, closing the right hand side of the coat? This would close the coat ‘ invisibly, as a 2bdb, and the clean result would lengthen and emphasise the fitted silhouette. You could of course still wear the belt just on occasion – and also thereby extend the fabric life considerably. Nice idea. It might look a little odd if it were fastened with no obvious button though? Reminds me of fashion ones that fasten with magnets and things. What a great looking Top Coat, with a truly polo look and feel. From the past of a dangerous sport. I believe that is the coat that saved the beavers in the early 1920’s. The coat and the look, wear the coat in good health with pride. I know you have covered 100 Hands but I wonder if you would take a greater look into Indian artisan work at some time. The hand made, bespoke work you write about is very much alive in India. When my wife visits, we get amazing hand embroidered saris and bespoke jewellery made. Recently I commissioned some cuff links in India based on some old Mughal designs – the result was stunning (and the cost relatively modest given the gold & precious stones used). While i love the level of details, i think i would have gone for buttons from a practice perspective. I must say the fabric looks absolutely stunning, so much so in fact that i called dormeuil who confirmed the fabric had been discontinued. I was nonetheless wondering whether you would have any tip as to where to find such fabric assuming there is still some stock with retailers for example? The coat looks great, I think you should keep it as is. I’m surprised you’re asking for other people’s opinions as you have experience of designing pieces for the PS shop. Have you ever seen a woman’s coat and thought, that’s nice (some coats are fairly universal)? Reason I ask is because a while ago I saw a guy wearing a beautiful Camel coloured coat and I asked where it was from and he said Max Mara, which only makes women’s clothes as far as I can see. Their 101801 icon coat looks great. I have a belvest DB overcoat from eBay where the seller reversed the image. I get it and the wrap betrayed that it was originally a women’s coat. But I liked the shoulders and sleeve head, the sweeping lapels, and dram it length enough I took it to an alterations tailor and just reveresed the wrap. I get loads of compliments and no one is any the wiser. Fundamentally, men should dress like men and avoid the unisex fad like the plague. Dressing in a masculine manner is essential for men and a pleasure as well. Avoiding fashion and focusing on timeless style can eliminate the nonsense and restore sanity concerning men’s clothing. If you need some examples to study consider Steve McQueen, the king if cool, and Daniel Craig. Study these men and use what works for you. You’ll look fantastic and masculine and, as an added benefit, women will notice as well. I might need to go buy a Knight’s armor. Yes Joel really. Of course you can dress in whatever manner you choose. However, your unfortunate use of hyperbole and ad hominem does not help to make your case. I’m always willing to listen to a well reasoned difference of opinion, but ad hominem attacks, whether direct or indirect, are just not appropriate. To see an excellent example of a thoughtful difference of opinion, please refer to Hugh’s comments above. Trench Coats & Great Coats. Both can be male/female and both look good on either. I have a Corneliani belted raglan single breasted overcoat made out of angora. I’m not sure what I’m looking for in the guide. Simon, I really like this coat. I think the elegance and simplicity of the design would be disrupted by the addition of buttons. For me the coat is not overly feminine, but is fashionable and refined, it does not tread into the characterization of “dandy”. In my opinion you score points for trying something a little different, and showing some creativity. i think it is a bit risky for my first overcoat, do you agree that? Do you have a sort of bucket list for clothes that you want? Suits, shirts shoes, ties, knitwear, underwear, accessories, coats, socks, swimming trunks, gloves, bags, briefcases, umbrellas, spectacles, sunglasses, (brands, manufacturers, designers, tailors, vicuña, super 200s, 2 fold 300 cotton, fur). I don’t mean something of everything I listed unless you want to, just listed them out as an example. This coat looks fantastic, and the color is particularly good. I don’t think you should add buttons just yet; belted coats are enjoying a bit of a moment right now (dare I say… fashionable) so why not enjoy riding the trend? You can always add them in a few years’ time when it’s over. (And yes, I realize riding a fashion trend might sounds like the antithesis of permanent style but, personally, I don’t think there’s anything inherently wrong with enjoying new styles, as long as they are consistent with an overall aesthetic, and still adhere to solid principles like fit, quality, etc. Perhaps there’s a distinction to be made between following fashion vs. being influenced by it..? Yes, nice point Andy. Particularly if you carefully consider fashions before adopting them, seeing whether they fit into your aesthetic. I guess relates to this post too. This is very odd! 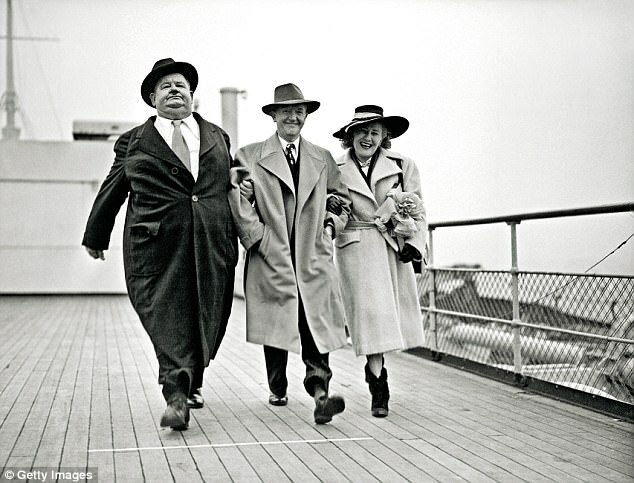 Last year I saw a photo of Stan Laurel on the Queen Mary wearing what I later identified as a Polo/Wrap coat which I learned were very popular pre-war. After some research I established it to be a Polo “wrap” coat, no buttons, Ulster Collar, Raglan Sleeve, Martingale belt and turnback cuffs and inverted pleat. I am able to visit many of the great mills in Yorkshire & Lancashire and often you can browse bunches in their mill shops and buy at VERY low cost from their outlet shops then have it made up at a local tailor. I bought a length of Camel hair from Dormeuil’s mill in Huddersfield (dormeuil #475002) and had Mr Laurel’s coat copied with a cupro lining and a poachers pocket and lined “hand warmers” in the pockets (very old school) by the very same tailor who made the Beatles stage suits when they first went to America. They are specialists in Navy Greatcoats and dress uniforms so this was very simple to them. It’s fun researching old designs then recreating or reinterpreting them, finding cloths etc. I can’t post a pic but I can post a link to the picture of Mr Laurel that inspired the coat. I love finding good deals at factory shops, I bought my favourite scarf from the Begg & Co factory outlet and I would love to visit the Northampton shoe makers factory shops. Please can you name your tailor and their shop where you had the coat made? I love Laurel & Hardy, the new film is supposed to be good. When I was at college in London, I used to buy fabric end pieces (enough for a suit) from the fabric mill offices in London. Yes, Craft Tailors in Liverpool. Sadly Mr Smith died recently and I am not sure the business continues.